On the morning of May 30th, 2012, Jang Geun Suk tweeted on his personal Twitter, “by Seo Joon, Jung Ha Na,” and uploaded a photo. In the published photo, the bride Ha Na was wearing a white low-cut wedding dress, with a garland on head, showing a bright smile. While Jang Geun Suk was wearing grown suit with white shirt, white jacket and black pant, and the arm was resting on the shoulder of YoonA. The heads of them tilted toward each other, looked very loving. 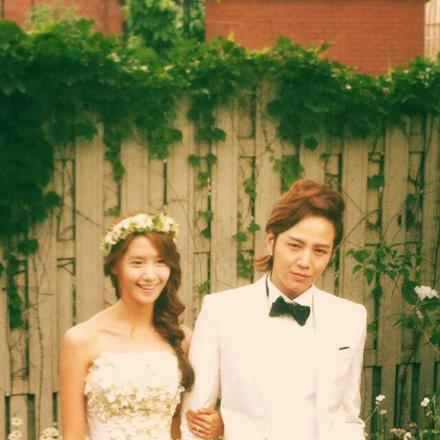 The fairy-like innocent beauty of YoonA and handsome look of Jang Geun Suk attracted a lot of eyeballs. Netizens commented on the photo, “They are really fit,” “Luckily it’s happy ending,” “Unfortunately couldn’t see Seo Jung couple anymore in future,” “Really is fairy couple,” and so on. In addition, the sad yet cannot bear to part from each other love acting by Jang Geun Suk and YoonA is praised by public, and "Love Rain" concluded on the May 29th with a happy ending.